Here's my idea: a short post every now and then, with a few photos, of what's going on in my life besides scrapping. I'll call these On the Home Front, so you'll know what's coming. Seems a better title than "upcoming attractions of possible future scrapbook pages". As if scrapping isn't enough of a hobby, I also have taken up my knitting needles again after many years. Sadly, my local yarn shop owners are retiring soon. 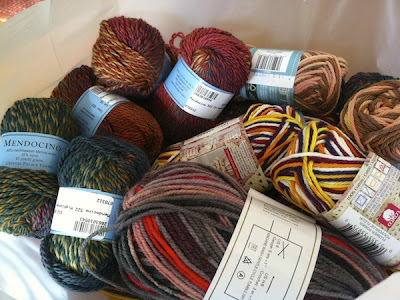 But on the positive side, everything in the store is being marked down, so I recently stocked up on enough yarn for plenty of socks and dish cloths. 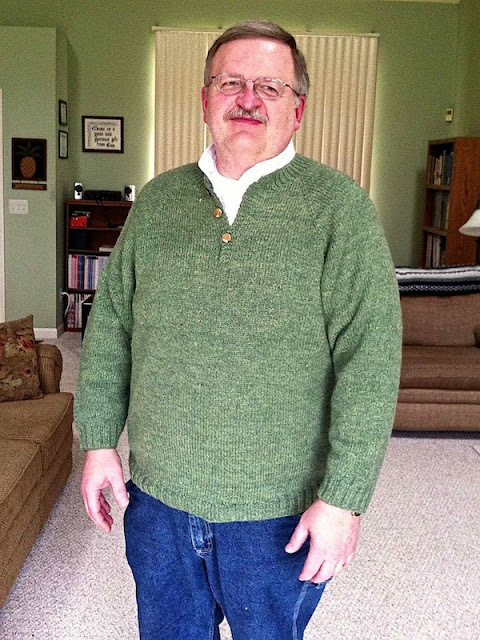 After many months of knitting, I finally finished this sweater for Phil. I can't help it, I'm pretty proud of how this turned out. Do you have other hobbies besides scrapbooking? I'm going to guess that many of us have more than one interest. I'd love to know about yours! He looks great in your beautiful knitting! My hidden other hobby is gardening but haven't been able to truly participate since the accident and surgery. I do go out when DH works int he garden...I sit on a bench and prune or deadhead! Knitted dishcloths? I'd never considered that. I haven't been able to do much knitting since DD was a baby. I have carpel tunnel syndrome and get pins and needles in my left hand - sometimes before I complete a row! Looking forward to seeing what you create. i have always wanted to learn to knit. As for my other hobbies, tennis ( i play 3x a week) and when i can reading but with a 7 and 4 yr old not much of that going on. looking forward to summer where i can normally knock off 3-5 books! Knitting! I have just finished a sweater for the man in this house too..but I still have to sew it up and I'm procrastinating on that.. This is a fine knit - I love the colour. That is one awesome sweater, Sue. I love the color. Wow, I am impressed! You are a multi talented lady!!! That sweater looks fantastic! Setting in those raglan sleeves must have been a challenge. You did a great job; I'm sure he will love wearing it. I used to knit and crochet but sadly my hands balk at these repetitive movements, particularly crochet. I sew and cook quit a bit. Great job with the sweater. I have all ways wanted to crochet but have never taken the time to learn. I am super impressed by your knitting talent. :) I am pretty much a one trick pony when it comes to crafting. I don't even use my scrapbook supplies to make cards very often. I'm learning to knit, but I doubt I'll be able to do anything as clever as this jumper. I'm so impressed by your talent .... What can't you do lol. Love the sweater...I haven't knitted since Kirsty was little! looks amazing!!! Love the green!! I think knitting would be so much fun and relaxing actually. We have a knitting store close by with classes, and I have thought about giving it a try. Wow, that sweater turned out great! When I'm not in my craft room, my other hobbies are reading and cooking - tried five new recipes last week.